This report, first published in 1985, written by a distinguished group of legal and public policy experts, documents the growing trade in hazardous industries and toxic products. Hazard export threatens the health and environment of workers and ordinary citizens the world over. It is carried out by transnational corporations, in order to locate their most dangerous industrial activities outside the US, in countries where regulatory controls may be less strict. The issues represented here include occupational safety, environmental protection, international relations and problems of legal control. 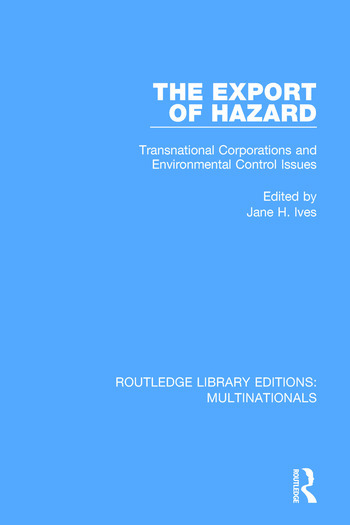 Attention is focused on the political and economic impact of hazard export on the US, Europe and developing countries, and the book’s critical analysis is addressed directly to the institutional level best suited to constructive action. This title will be of interest to students of business studies.